Sharp Hospital Receives Prestigious National Certification (and some exciting Carnaval news) | ¡VidaMaz! State Secretary of Health Echeverría, and Mazatlán Mayor Felton. Mexico’s General Health Council has given Mazatlán’s own Hospital Sharp an impressive 9.5 out of 10 points on a prestigious patient care accreditation, making it one of only two hospitals in Sinaloa to achieve such a ranking. The award comes after several years of painstaking work by administration and staff—from janitors, cooks and bookkeepers to doctors, nurses and technicians. 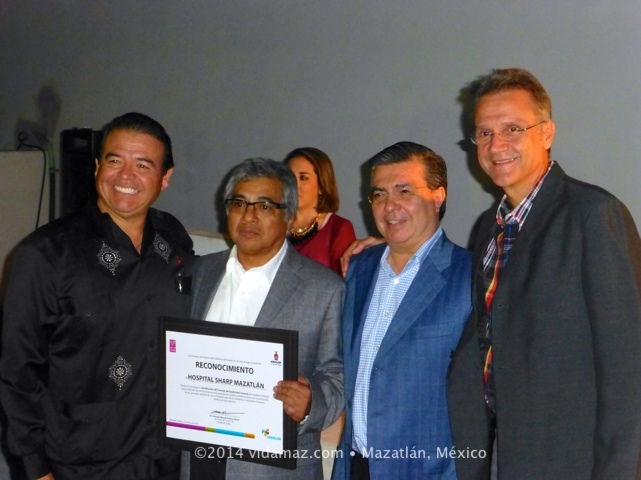 Greg and I were pleased to be join the banquet on top of SECTUR’s offices on the malecón last Wednesday night, to honor those involved in this effort to better position Mazatlán in national and international medical tourism markets. It was a joy to be in the presence of so many different types of medical professionals enjoying one another’s company and accomplishments. The accreditation centers on patient care. Each aspect of the quality of medical attention and patient safety, from evidence gathering to diagnosis and treatment as well as accurate record keeping with precise checks and balances was evaluated against international standards. Hospital Sharp has a modern physical facility with open spaces and 41 single-bed rooms, along with constant fresh air intake to lessen the transfer of germs and illness. It is a full service, 24-7 surgical facility, has the only dialysis facility in Mazatlán, and is completely self-sufficient—equipped with powerful generators in the event of a disruption in electrical service. Construction began in 1994, and the facility was built to USA standards. Hospital Sharp Mazatlán is located at Av. Rafael Buelna y Dr. Jesús Kumate S/N Fracc, Hacienda Las Cruces C.P. 82126, Mazatlán Sinaloa, telephone (669) 986 56 78. Judy Setrakov, who works at Sharp as a medical tourism consultant, received a special tourist ambassador award. She, Doctor Juan Fernando Barraza, and Christian Barrios form Sharp’s Medical Tourism group. They can be reached at the number above, extension 336. On a completely different note, I also found out on Wednesday evening some extremely exciting news. Carnavál Internacional de Mazatlán will have a Japanese-themed float and dance group this year, to commemorate 400 years of Japan-Mexico diplomatic relations. The float will be a samurai ship. I have been invited to the dance troupe. Special choreography, including a “tequila o-dori,” will be performed, taught to us by a Japanese dance professional from Mexico City. That changes up our annual parade party, but it sure should be fun!